Ease of Navigation: Yes. 5/5. I could locate all that I wanted very easily. And the best part is that they have categories that you need to check and your search narrows down condiserably. So you don’t really need to go through a hazaar products that you do not want to buy. Products: Good collection. But I guess, they could do with adding more brands! Customer Care: 5/5 I found the customer care very friendly and they were ready to answer my queries via phone and chat. It is a colour that is likely to suit all skin tones. Since I am on the wheatish side, I refrain from picking up light colours. 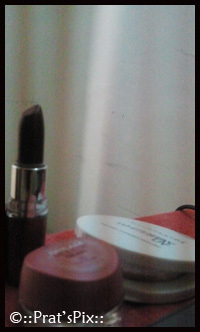 This lipstick did not have a fragrance and it glides over your lips. 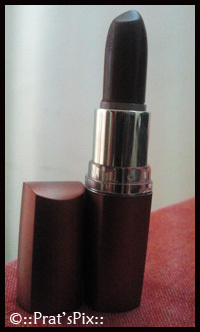 It gives your lips a nice creamy feel and it has a built in lip balm that nourishes your lips. Cost: I picked this one for Rs. 211.20 against Rs. 220 which is the MRP because Goodlife was having a discount on the products. 2. Maybelline White Stay UV pressed Fairness Compact Powder – Fawn: The packaging was simple and it is a white round box with pressed powder. I chose the darkest shade as it blended perfectly on my wheatish skin. It stayed on my skin till the time I washed my face with a scrub to get rid of the makeup I had worn. How to use: Pat small amounts gently on face and neck. Blend using puff. Suitable for everyday use. Cost: I picked this one for Rs. 144 against Rs. 150 which is the MRP because Goodlife was having a discount on the products. This comes in a tiny unbreakable glass jar. When I first tried it on at a friends place, I liked the mousse feel it had and you needed to just dab it around your cheekbones and blend it well to get the right highlights. The colour of the lid is the same as the mousse that is packaged inside. I like it because its non fussy and extremely easy to use. If you have talons, chances are that you may have the blush stuck in the nails too. So you could use a cotton bud or a brush to pick out the desired quantity that you want to apply. 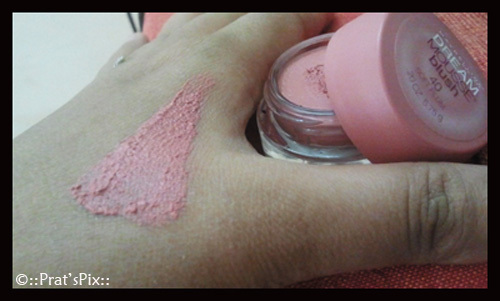 For Best Results:- With your fingertips, pat a small amount of blush onto the apples of your cheeks. Use feathery strokes to blend gently from your cheekbones to your temples. To build color intensity, apply more blush.- With your fingertips, pat a small amount of blush onto the apples of your cheeks. Use feathery strokes to blend gently from your cheekbones to your temples. To build color intensity, apply more blush. Cost: I picked this one for Rs. 196.80 against Rs. 205 which is the MRP because Goodlife was having a discount on the products.